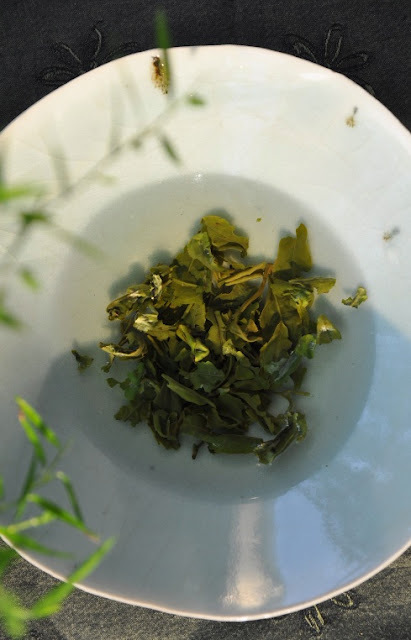 Process: Bi Luo Chun, green tea. Oven dried. Bi Luo Chun from Taiwan is quite different from the famous, original Jiangsu Bi Luo Chun. 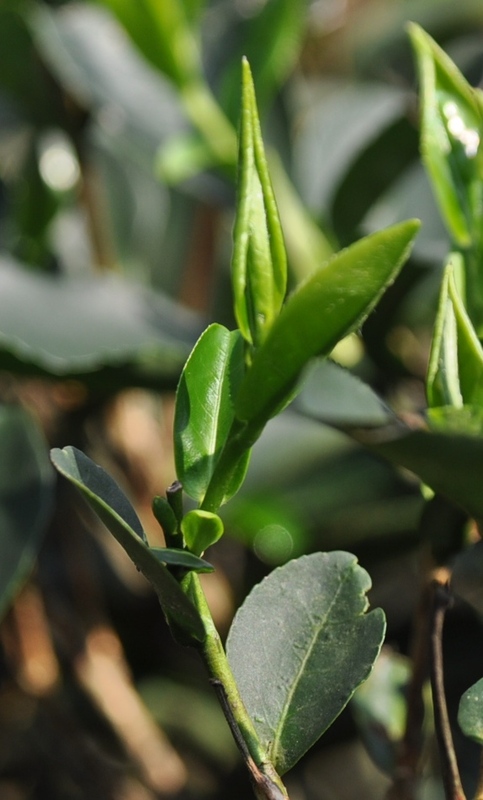 The leaves are much bigger, due to a different cultivar. Also, thanks to its more southern location, the start of the harvest happens roughly two weeks earlier than in China. This year, there have been a lot of rainfalls at the end of the cold winter. Plants had time to rest and get nourishment. The sun has arrived at the right moment to let the buds grow strong. As spring progresses and temperatures rise, the shape of the leaves will change and loose its 'tippyness', its pointy, spear like appearance. So, it's in the early season that we can find the smallest and most tender tea buds. So much freshness is concentrated in these young leaves, that it's best to enjoy green tea with a big ration of water to leaves. 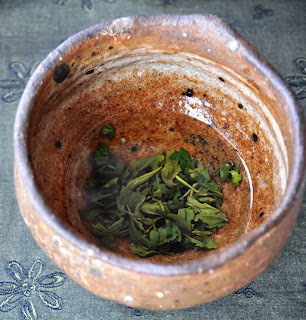 One very simple way to enjoy such a tea is brewing it in a tea bowl. 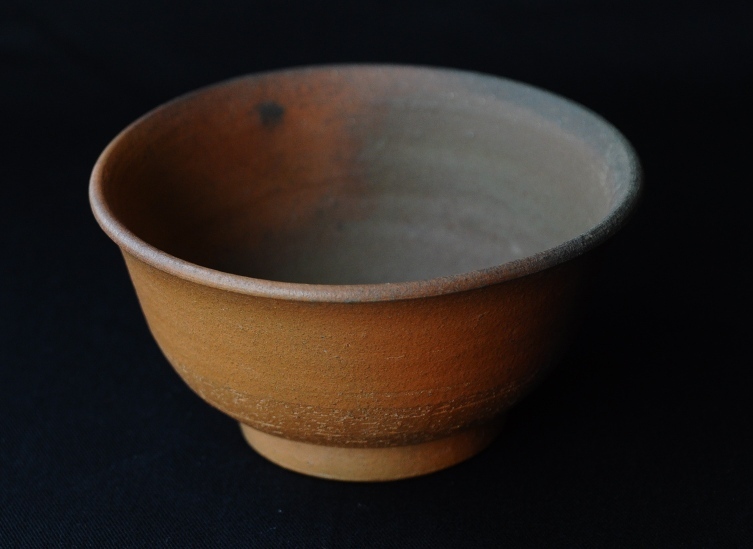 Here, for instance, I use a very shallow celadon bowl that could be called a summer bowl. The large surface of water cools down faster than a deep and narrow bowl. Bowls are also great vessels to simply watch and marvel at the performance of these green leaves as they open up. Poured on the side, the boiling water creates a circular movement in the bowl. 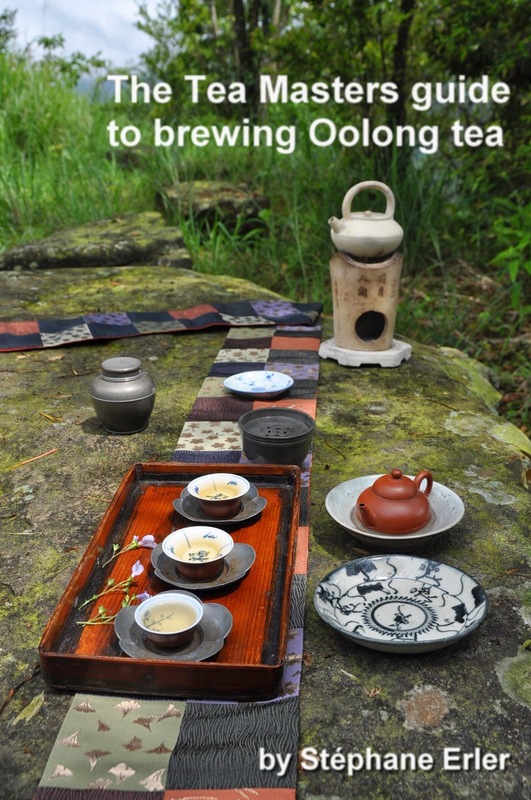 This brewing method also lets you taste the tea as it continues to brew, from the lightest to strongest concentration. The flavors go from sweet, light green freshness to a more vegetable (artichoke) green with zesty feeling. Somewhere during the brew even light flowers scents would appear. 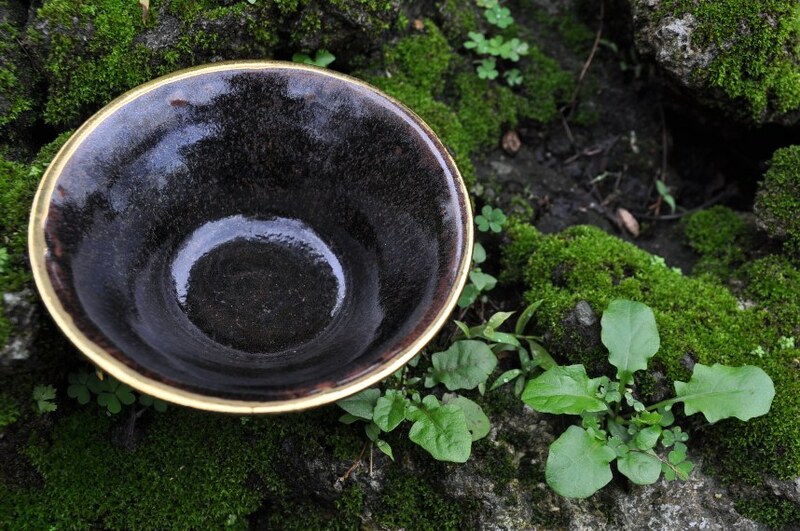 - The black "hare's fur" glaze Jianyang bowl (left) kept the temperature the highest. The brew was noticeably darker. This made the flavors come out the most. 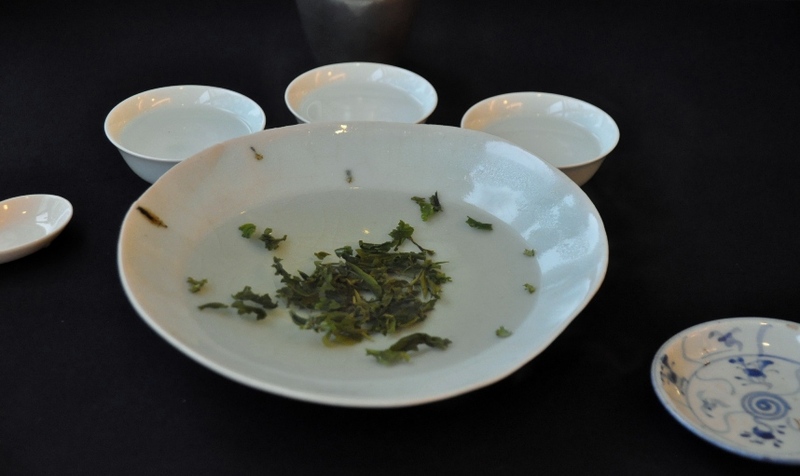 - The wide celadon bowl (middle) let the brew cool down faster than other bowls, resulting in lighter flavors. - The completely dark bowl (made in Europe) was in between. The clay doesn't retain heat as well as that from Jianyang (Fujian). 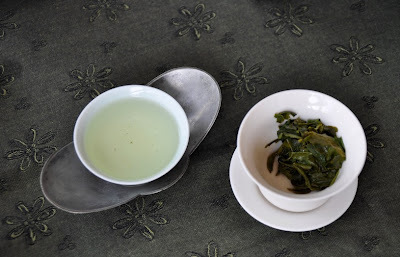 - Left, the blue/green bowl from Teajar gives similar results as the celadon. The rim is slightly bent inwards and the shape feels surely footed. Harmony and stability. His latest creations are very similar in shape, but the colors are fantastic. - The unglazed wood fired bowl by David Louveau, in the middle, reacts very differently than the glazed bowls. It adds depth and sweetness to the tea. There is very little absorption of flavors. It's a rock solid bowl with little porosity. The contrast between the massive, rough bowl and the light, fresh fragrances adds an element of surprise. The green leaves seem to have found back to their natural element. The brown, earth/rock color and the shape suggest more the autumn season. 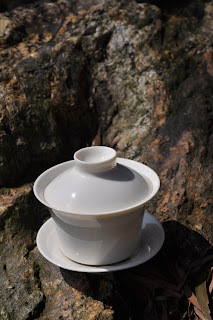 I brewed the Bi Luo Chun with the gaiwan covered. The brew was much more concentrated (and hotter) than what I obtained in the bowls. What a difference a cover makes! It retains heat and enables an easy pouring out of the tea. It's such a convenient tea vessel, suitable for all kinds of teas! 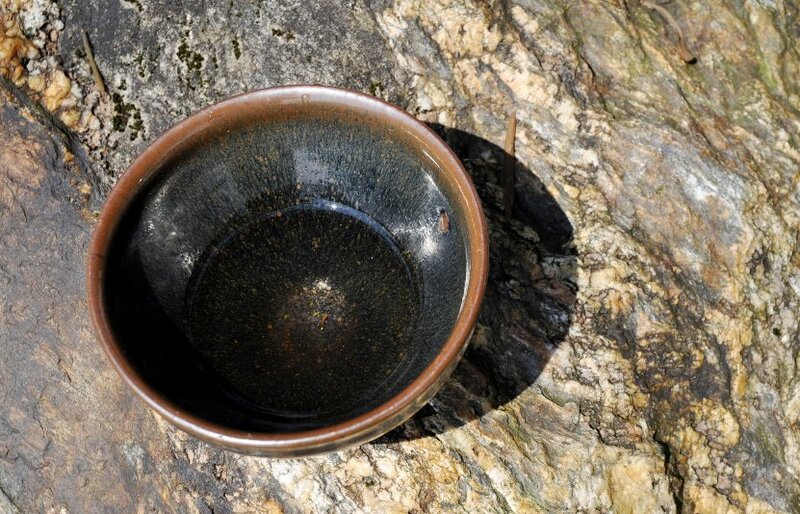 With the bowls, you can taste the tea as it evolves. - L'ajout d'une éponge 'magique' blanche à ma sélection. 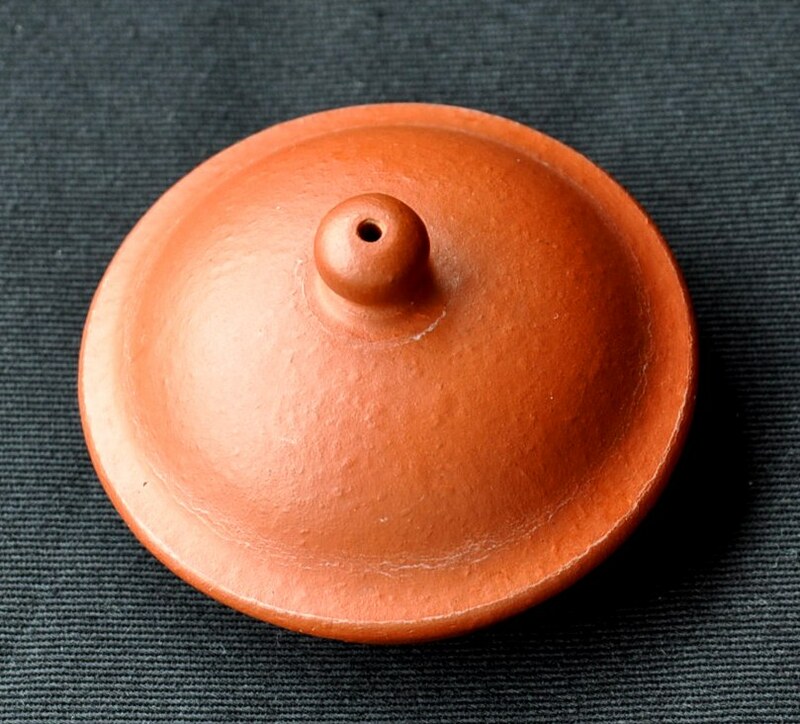 Elle permet de nettoyer les taches de thé sur la porcelaine (et la poterie) sans savon ou détergent (un peu d'eau suffit). Les accessoires redeviennent comme neufs! 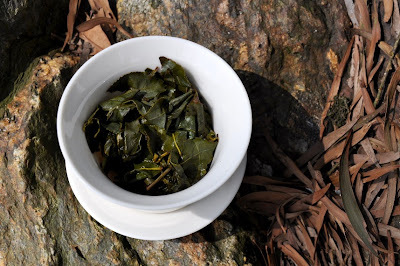 - Le retour dans ma sélection de mon jeune puerh cru sauvage préféré: la galette de Lincang du printemps 2006. 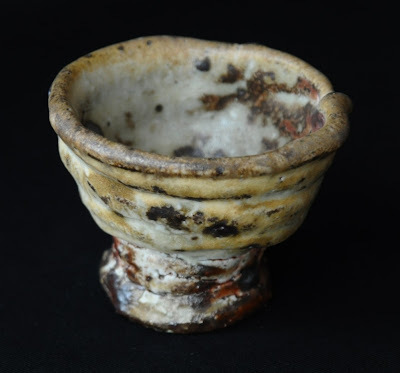 My good friend David Louveau de la Guigneraye has sent me 10 wonderful wood fired cups. These are his own creations. And they carry so much of David's personality that I feel like starting the appreciation of these cups by giving you some background about David. His noble and ancient name can be traced back to the Carolingian era. Due to the French revolution, I guess, his ancestors left France for the French overseas territories. Born in Guadeloupe in 1971, he grew up in New Caledonia (930 miles east of Australia). There, he led a very free and wild childhood at the contact with the local tribes. Think Robinson Crusoe. 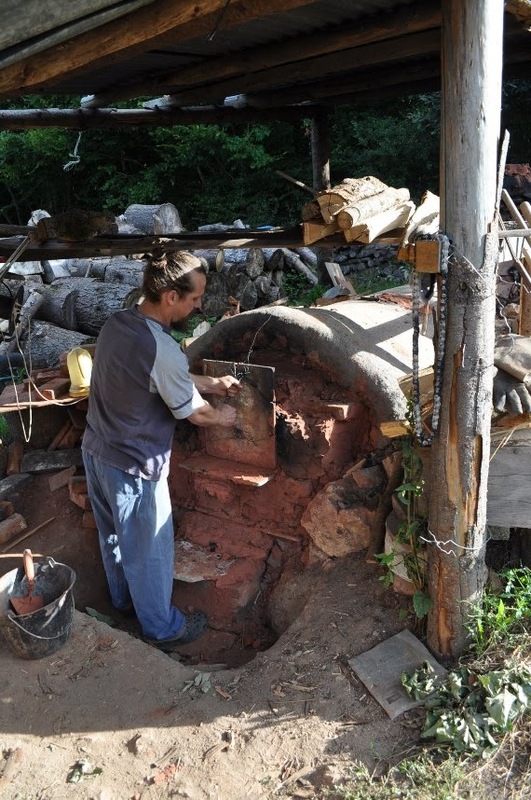 He is the kind of guy who builds huts or kilns from scratch, almost with his bare hands. 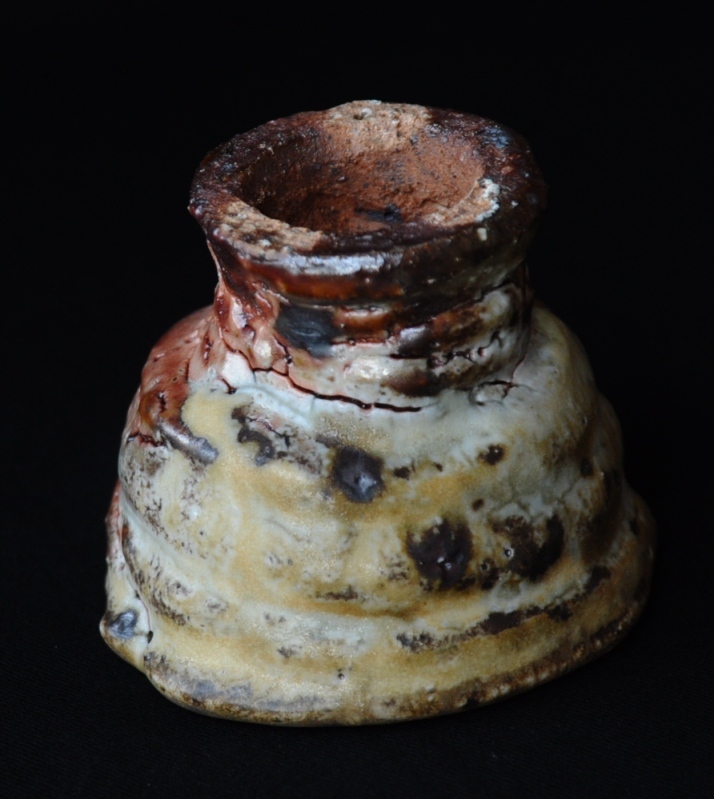 A young adult, he left New Caledonia for 3 years to study pottery with Japanese potters in Japan and Canada. 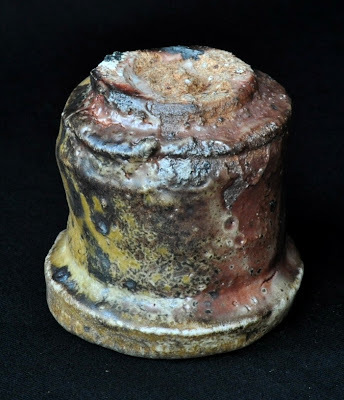 He returned to New Caledonia and worked as a potter for 10 years before moving to France (with his French wife). David Louveau also practiced martial arts and was an acrobat in his younger years. These cups don't come with a predefined or even refined shape in mind. 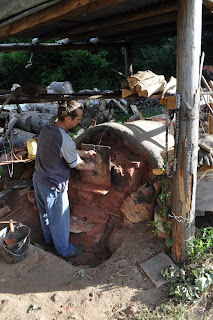 David feels the clay with his hands on the pottery wheel that he powers by foot. Then, he just lets the shape appear spontaneously. It's like a "jam session" for a musician or improvisation for an actor. He tries not to think, but to feel the wild energy of his clay and what it should/wants to become. 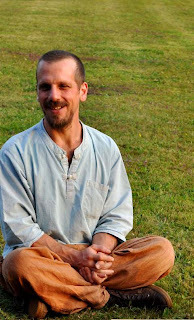 So, here David draws on his personal experience of bringing peace and balance to his wild roots. The older and more experienced David gets, the more controlled power exudes from his wild pieces. For a potter, nothing is more important than good clay. (See my article on teapots, for instance). In 'A potter's book', Bernard Leach (1945) explains that the raw material will impact the character of pottery and recommends to use local clay. This is exactly what David did for these cups. 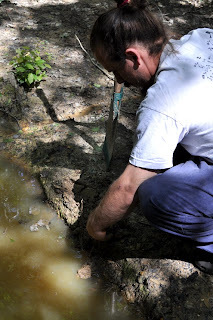 The earth comes from holes he dug near La Borne, an ancient pottery town in the center of France. This raw earth is the clay David has used the very same day after digging it out. It is completely unrefined. 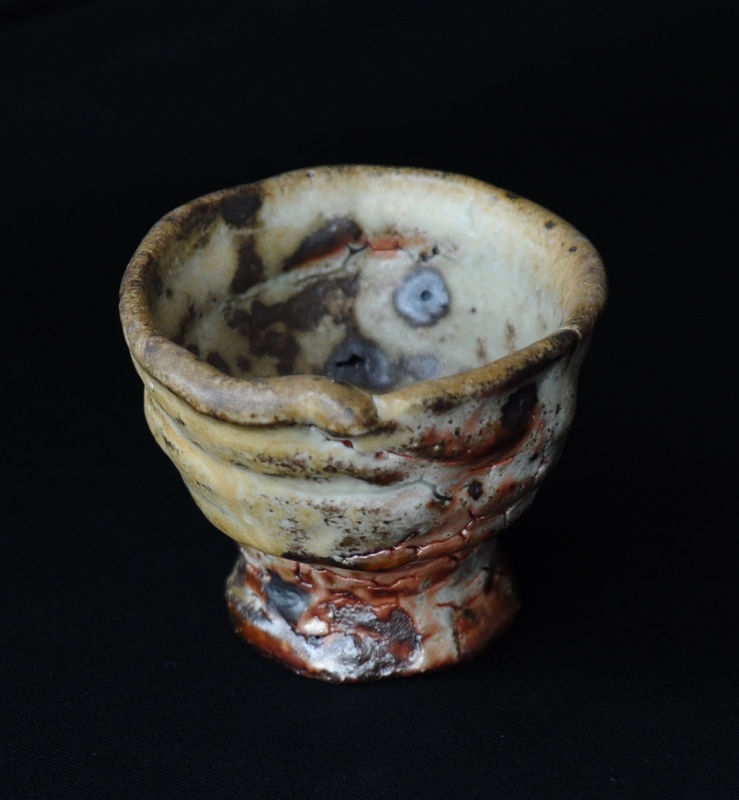 He then uses a shino type of glaze that is also made with unrefined, natural materials. This explains why the cups feel so rough and natural. The best place to observe the clay is the bottom of the cup. 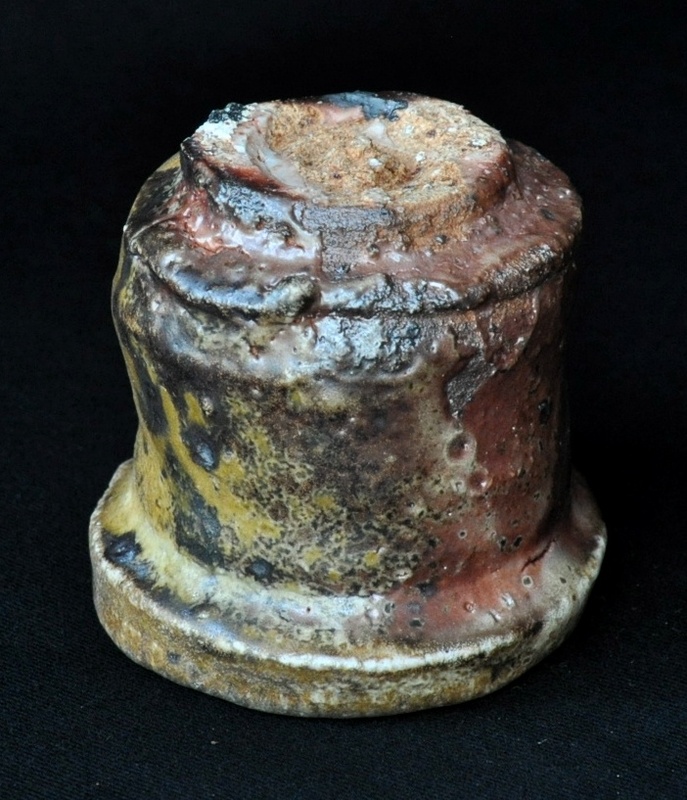 This unglazed part has also had the least impact from the firing. So, that's where you can see how unrefined the clay is. 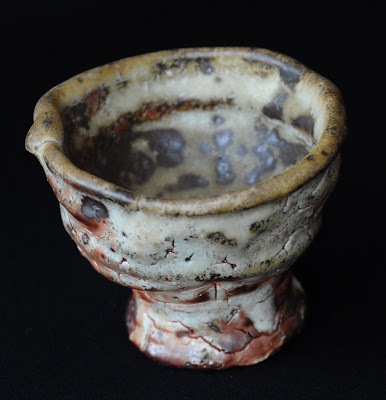 The many color variations on these cups come mainly from the wood firing in this small anagama kiln. (1 sqm volume). The cups were placed at the back of the kiln. The temperature reached 1350 degrees Celcius (2462 Fahrenheit!). 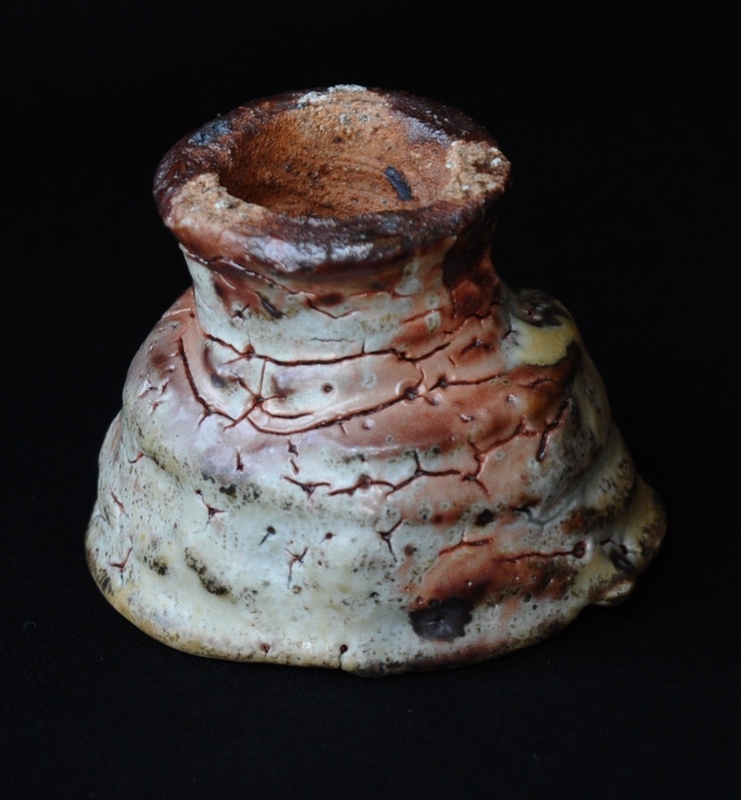 This high temperature has completely hardened the clay and glaze. This smooth 'rock' feeling is not a small achievement. Traditional wood firing is difficult to control. The side exposed to the fire takes a different color than the other side. There are so many nuances in-between. This is what makes it so fascinating: each cup is like a chocolate from Forrest Gump's box: you never know what you'll get! The best place to hold a cup with this shape is the rim. It's quite thick and not too hot. Even the potter doesn't know what will come out when he opens his kiln after it has cooled down (for several days). 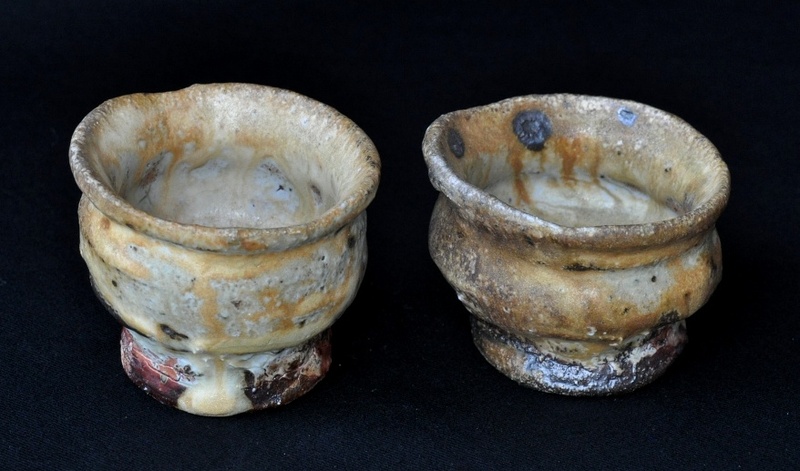 These Earth and Fire cups are true reflections of David Louveau's approach and personality. He channels the untamed energy of rough clay and wood fire into these primal shapes. The energy is there to see and touch. And to drink also! 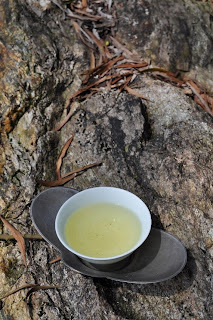 These cups are very good fits with puerh. Shu pu looks even darker in them! 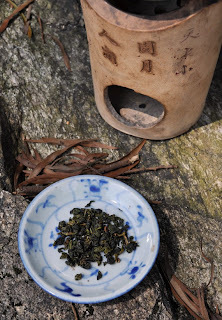 The cups magnify the natural, wild energy of puerh. Thank you so much, David, for sending me these 10 wonderful cups that I'm adding to my selection! The color changes due to the wood firing is very obvious: the darker parts are those that had less contact with the fire. This bowl feels more porous, because the firing temperature was lower than what David reaches nowadays. Here, we can measure how his firing skills have improved with time and experience. He has gongfu! 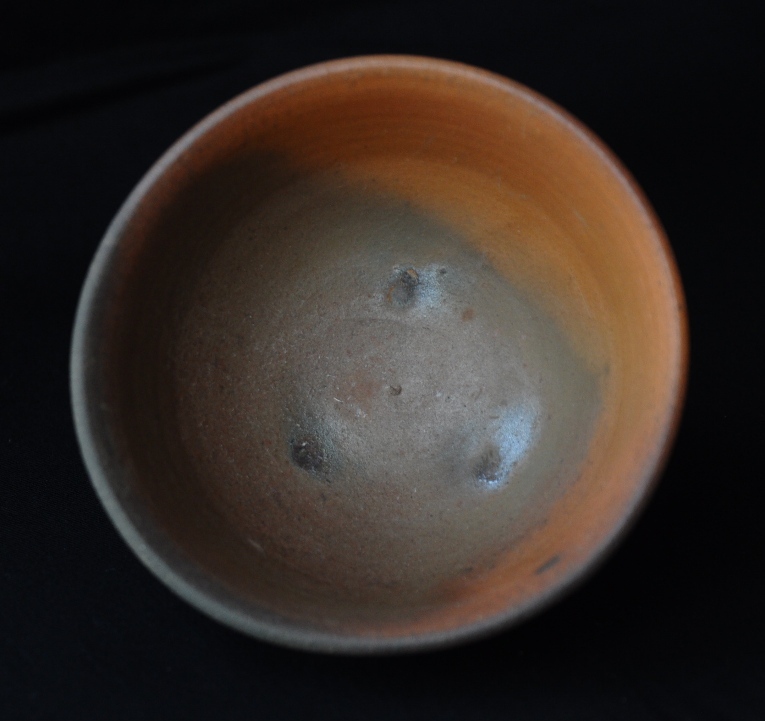 And these 3 marks inside the bowl show that another bowl was stacked inside it during the firing! Fresh leaves are about to be harvested and processed into Bi Luo Chun. The taste of spring is in that first cup of green tea. The lightness of sunshine and the sweetness of nature. Le thé est un breuvage complexe. J'en suis à ma neuvième année de cours avec Teaparker, mais continue d'en apprendre à chacun de mes cours hebdomadaires. C'est aussi cela qui fait le charme du thé: il n'arrête pas de nous étonner par sa complexité. Pour simplifier l'étude du thé, il faut pouvoir fixer les variables (oxydation, cultivar, saison, origine, process...) Boire 2/3 thés d'un même terroir, mais de saisons ou d'années ou cultivars ou de modes de conservation différents permet de mieux saisir d'où viennent les nuances, et de quel ordre sont ces nuances. L'autre enjeu important est de savoir apprécier le niveau de qualité d'un thé par la dégustation plutôt que par le prix. 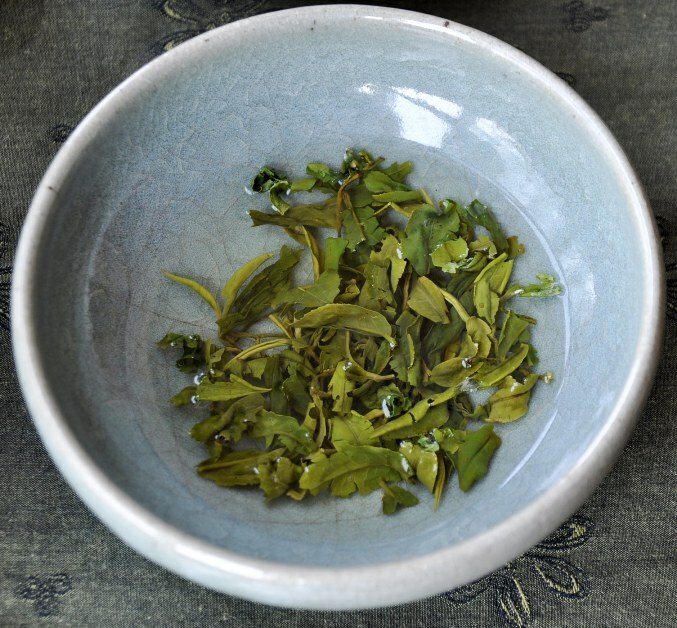 Qu'est-ce qui fait un bon thé? Pureté des saveurs, une bouche qui laisse une impression clean après passage de l'infusion, une gorge qui ne s'est pas serrée lors de la déglutition et une longueur en bouche sucrée, énergique et qui n'en finit pas de stimuler agréablement nos papilles. Voici mon résumé des qualités d'un bon thé. Avec cette méthode, on peut ouvrir la porte aux secrets de la plupart des thés, pourvu qu'on ait basé ses connaissances sur des fondements solides. Certains thés (jeunes et frais) sont plus simples que d'autres à étudier et à apprécier. La complexité grandit avec l'ajout de nouvelles dimensions: torréfaction, âge. 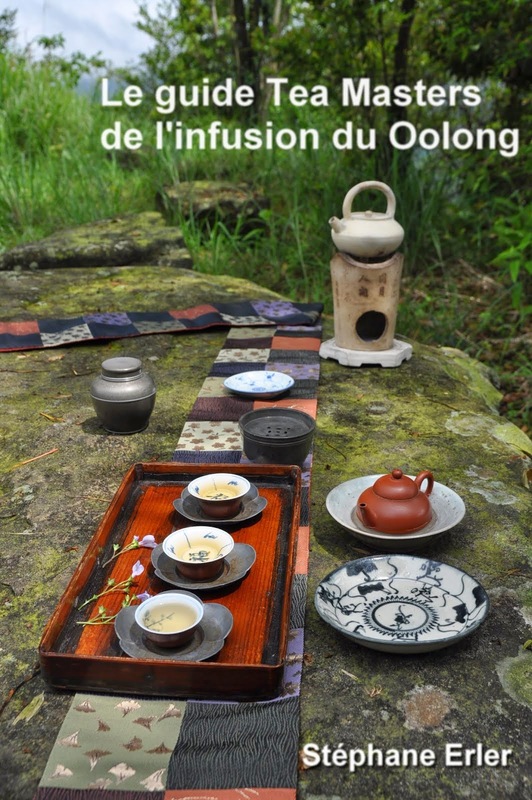 Il est donc naturel que les Oolongs torréfiés offrent une grande diversité de saveurs et soient plus complexes à comprendre. A mi-chemin dans l'oxydation et dans le degré de torréfaction, ils ne sont ni verts ni rouges, ni crus ni cuits. Ils mêlent fraicheur et chaleur, vivacité et moelleux. Bien réussis, ils combinent ces caractéristiques de manière équilibrée. 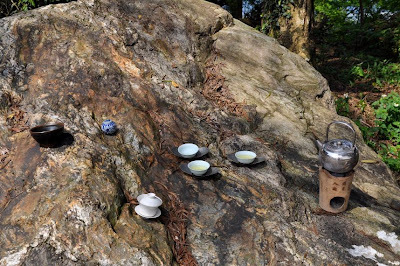 (Mes Hung Shui Oolongs de Shan Lin Shi sont d'excellents exemples). L'exploration peut continuer. Une fois le bon thé compris, on peut s'aventurer sur le chemin des accessoires et de leur interaction avec la méthode de préparation. A chaque étape, à chaque nouvel ajout d'un accessoire ou d'un changement de geste, l'objectif est simple: augmenter le plaisir. Utilisé à bon escient, chaque accessoire rend l'expérience plus riche de sens. 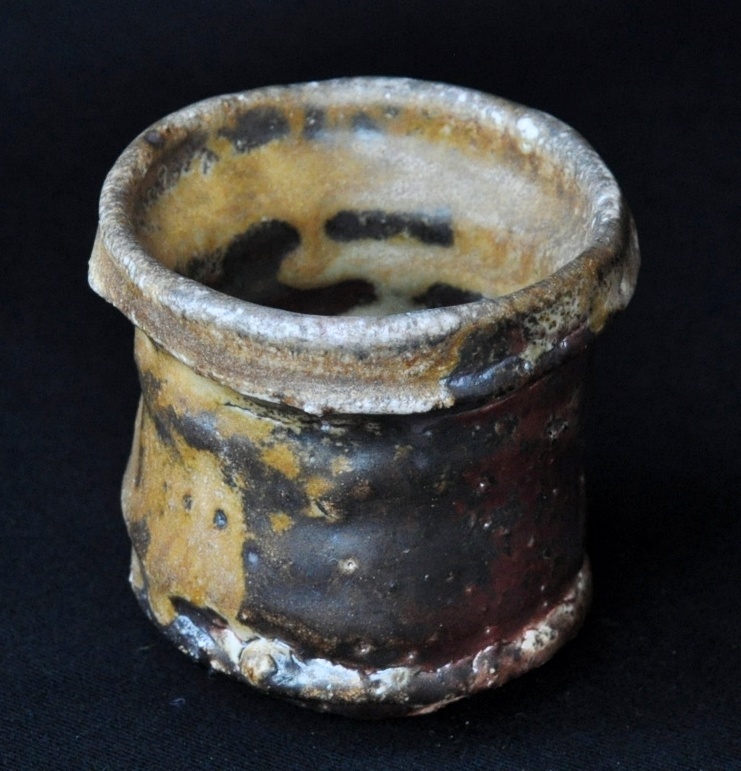 After the basic and potter's perspectives, we examined a collector's perspective. Today, I will show that a tea drinker would evaluate a teapot with a different focus. Let's start with the obvious difference between the tea drinker and those who look at a teapot as a piece of craftsmanship: the tea drinker is not just looking, exhibiting or storing the teapot, he's using it! The value of the teapot is linked to its usage. 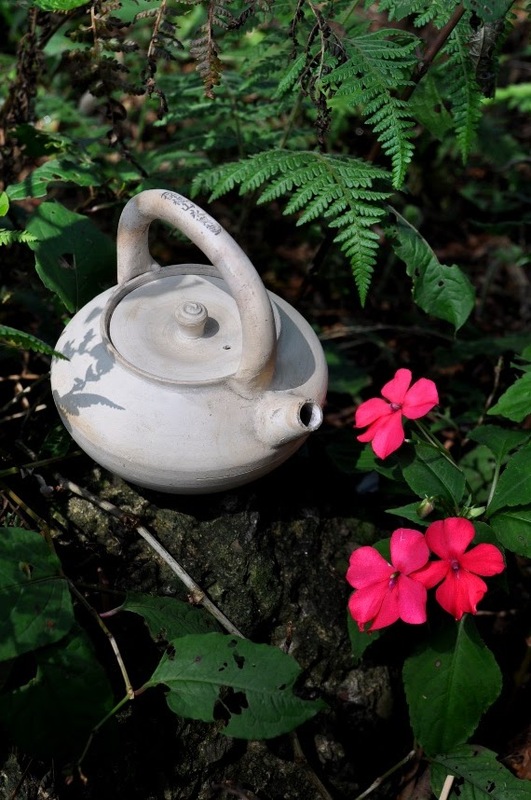 A teapot that you don't use is worthless. So, what do we, tea drinkers, appreciate in a teapot when we make tea? 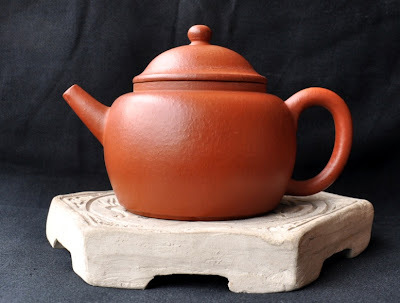 What are the qualities a teapot should display? 1. Conveying the taste and aromas of the leaves the best way possible and improve them compared to other vessels. 2. A certain ease in handling the teapot when brewing tea. 3. A sense of aesthetic beauty that doesn't compromise its functionality, but builds on it. 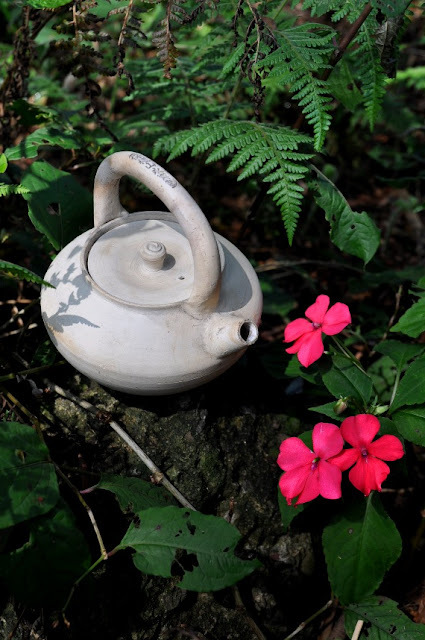 To summarize, a good teapot will make good tea with great ease and with a sense of beauty. 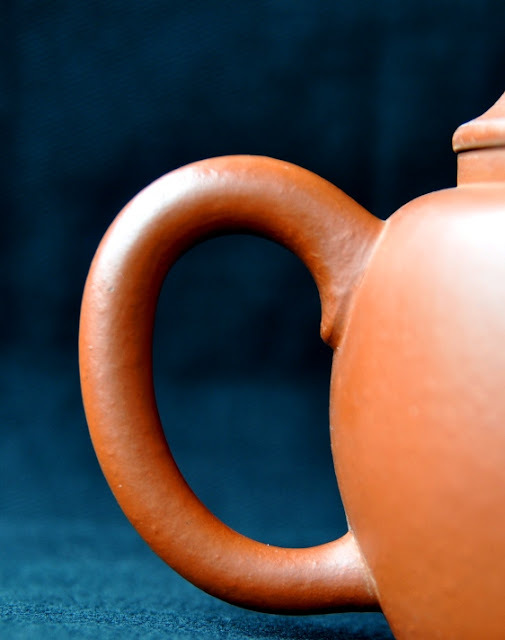 The most important teapot factor that influences the outcome of the brew is the clay. A chop is easily faked, a shape is also quite easy to imitate, but quality clay makes all the difference. 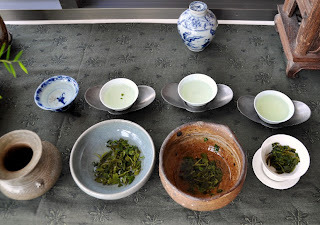 Before we examine the characteristics of clay, I want to emphasize the concept of clay quality with an analogy to Yan Cha. The quality level for clays bearing the same name can vary greatly. 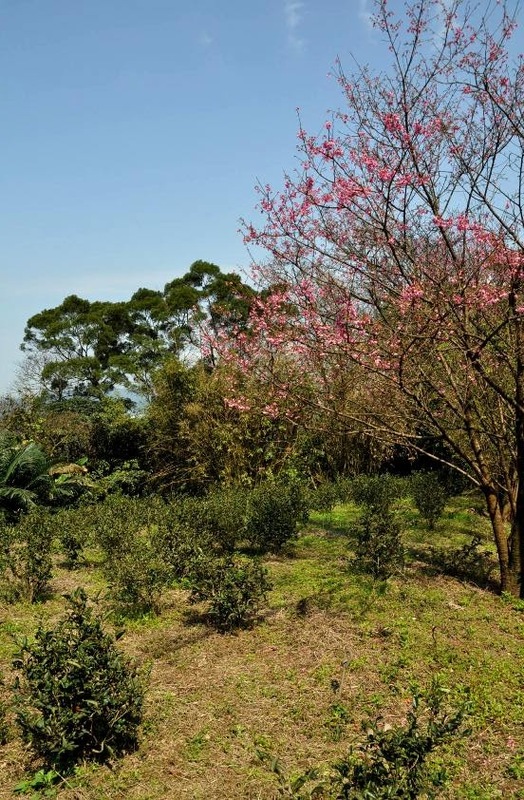 And, like Yan Cha, top quality clays come from precise locations and are obtained through traditional methods of drying, filtering, resting... Such small extractions result in very pure clay. 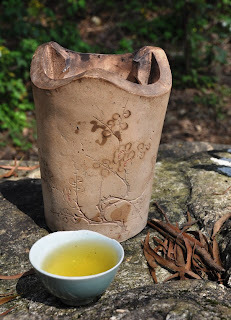 Then, as with Ban Yan Cha, there's clay made obtained nearby in great quantity and treated with more mechanized methods. Such clay is diluted and only average. And then, as with the countless copies of Yan Cha coming from other provinces, clays are imitated and often obtained through mixing of coloring elements. Such clays are not natural and often create a bad, artificial smell in the teapot. The difference between good and average clay is often a matter of concentration. Good clay is usually finer and more compact. Between real and faked clay, it's often a matter of how natural the color and texture feels. How does clay impact the tea? a. Hard clays absorb fewer flavors. 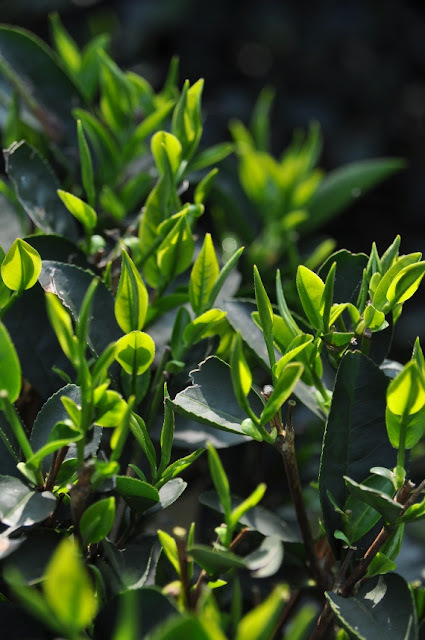 Zhuni, for instance, is known for being very hard, which helps extract all the scents, good and bad, from the leaves. 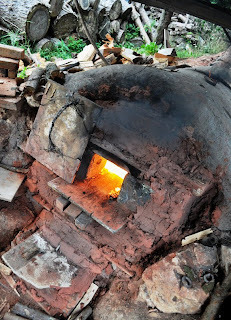 Hard clay is also more difficult to fire : the kiln has to reach a higher temperature. 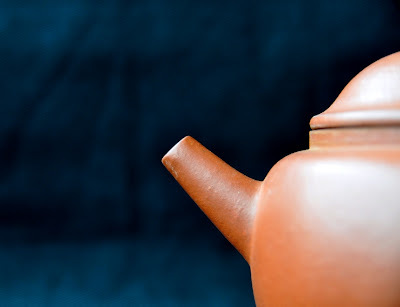 Underfired teapots end up sounding dull as their skin is softer. b. Retaining heat. 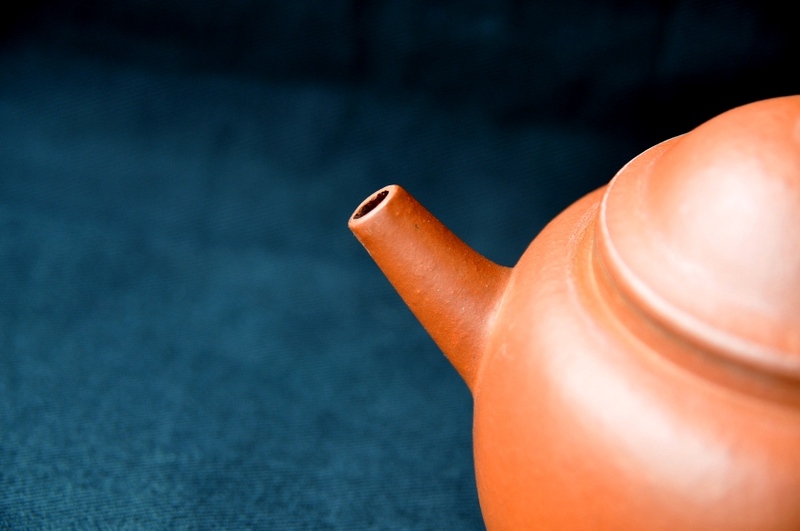 Teapots are usually preheated to help them maintain the water brewing at as high a temperature as possible. 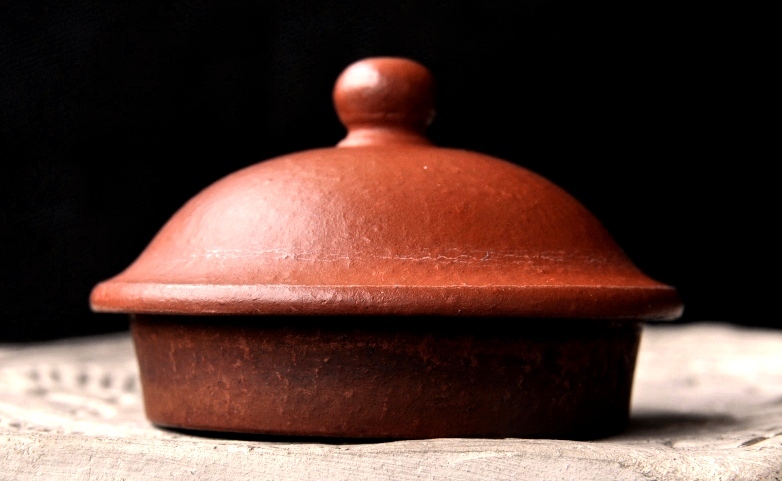 Good clays retain heat longer and higher. This allows to extract more flavors from the leaves. 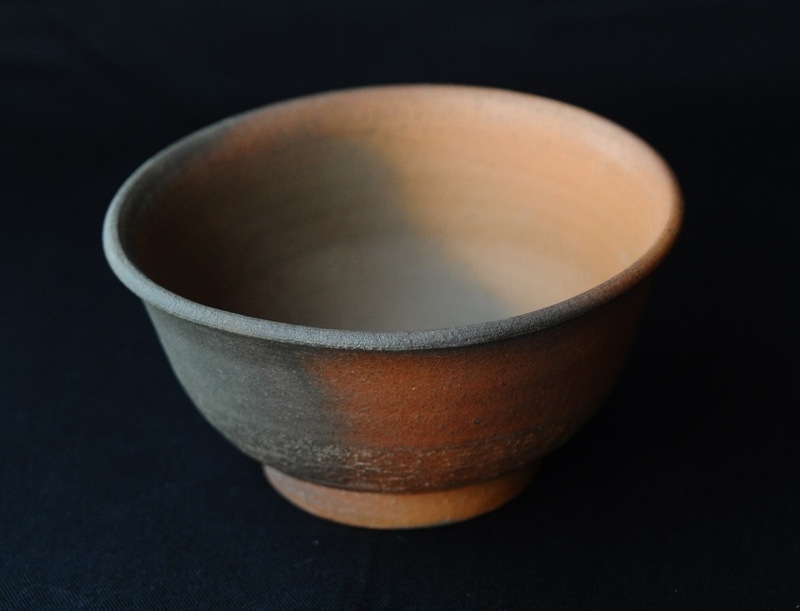 Zhuni, iron rich clay and Yixing purple clays are good examples. Porcelain, on the other hand, drops quickly in temperature. Thick walls also retain heat longer. c. Porous clays help filter some bad flavors. Silver and gold are pure, hard metals that retain heat well. They extract flavors with uncompromising sharpness. However, these precious metals lack the filtering capability of clay. 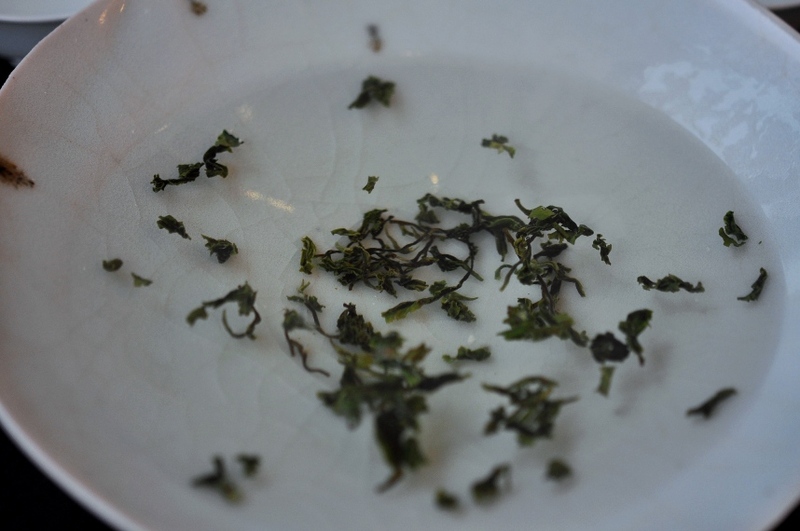 The porous texture inside the teapot and the walls under the cover give the tea plenty of surface to interact with. 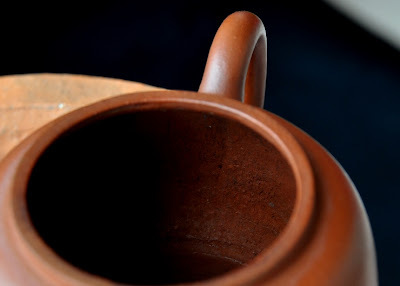 A good clay can purify and add balance, depth to the brew. Softer clays are more porous than hard clays. 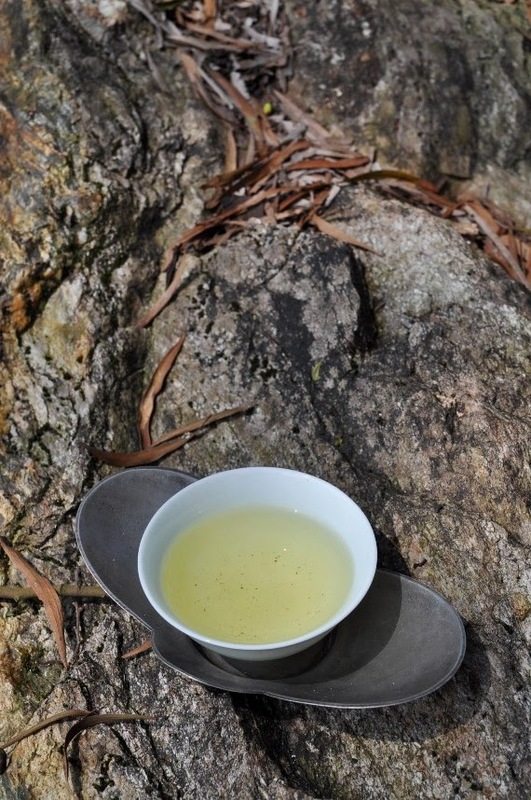 Yixing zini and di cao qing clays achieve a good balance between hardness and porosity. 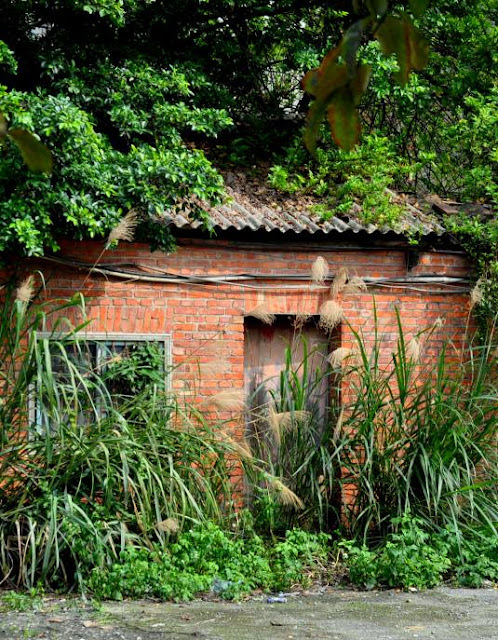 Duanni, hungni and Chaozhou clays are softer and quite porous. 2. Ease of handling. The 3 major points. It looks like a ear. Attached to the body of the teapot, its function is to let us hold the teapot without burning our fingers. 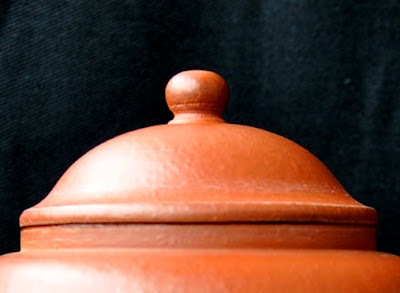 the top of the handle is often thicker than below, so as to provide some resistance for our fingers. And even though it looks like a curved cylinger, the shape is slightly square where our fingers hold it. This improves the grip, making it easier to hold with one hand. We feel very secure that the teapot won't slip if the handle is well designed. Similarly, the knob helps us to open and close the teapot several times during a brewing without burning our finger. 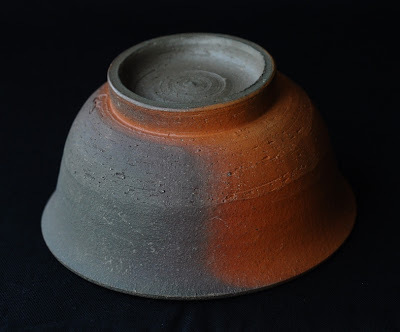 It doesn't just look harmonious with the rest of the pot, but is placed and shaped in such a way that it's easy to hold. One way to improve the handling of the knob is to slightly increase the distance between the cover and the knob. If it were too close, our fingers would often touch the hot cover and get hurt. 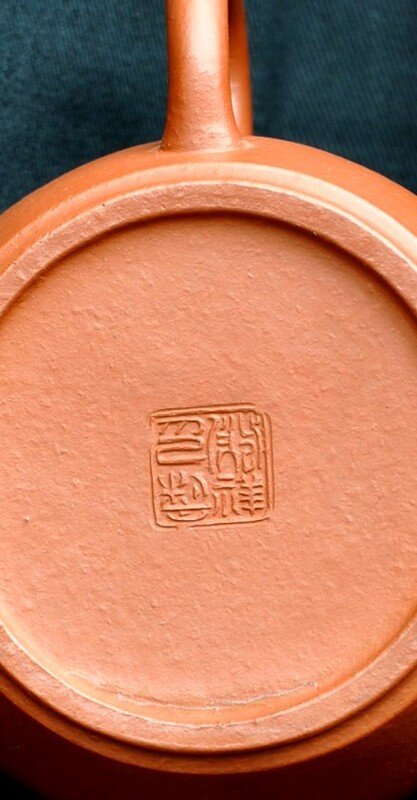 Located on top of the teapot and in the middle of the cover, the knob is the central point of the teapot. Our attention is automatically drawn there. A well centered hole in the knob shows the maker's attention to important details. 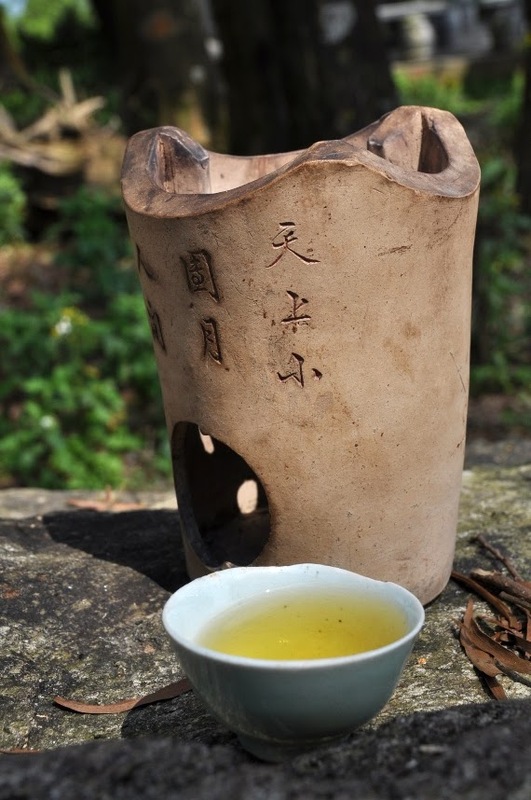 The shape of the spout determines the strength, angle of the flow of the tea coming out from the teapot. A smooth flow is easier to control when pouring tea in the cups. It's also more peaceful to watch. A well shaped spout won't be easily obstructed by tea leaves. 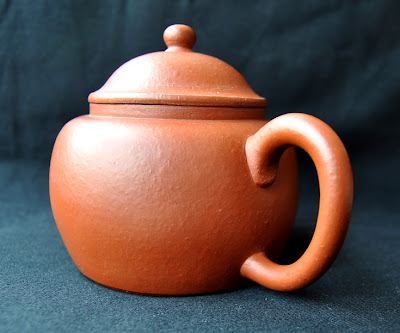 Except for some decorations, the aesthetics of a teapot are not separate from its function of making good tea easily. That's the reason why we can combine the basic and the tea user's perspectives to see the deep beauty of a teapot. They complete each other. The tea drinker will always try to imagine how a teapot would brew a certain kind of tea. Pairing tea and teapot is a real challenge. Great teas require particularly pure and hard clays to extract all their fine flavors. 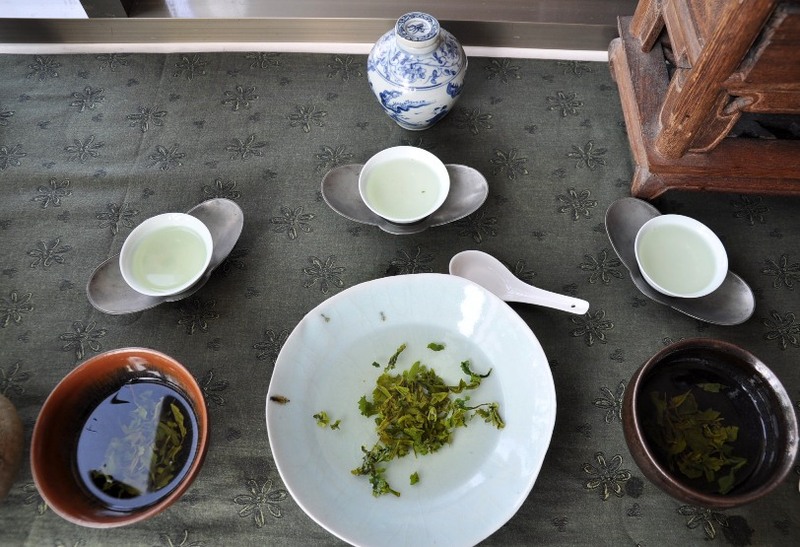 And average teas are better served by more porous clays that can hide their defects. So, it's not because a teapot doesn't brew one kind of tea well that it's not a good teapot. It could also simply mean that it's not well paired. So, when you choose a teapot, keep in mind the teas that you drink, so that you can enjoy it as often as possible! And don't hesitate to try different teas in it to find out which tea your teapot handles best. C’est sa première larme et son premier sourire." On annonçait un temps instable, hier. Finalement, c'est à une journée ensoleillée à laquelle j'eus droit. 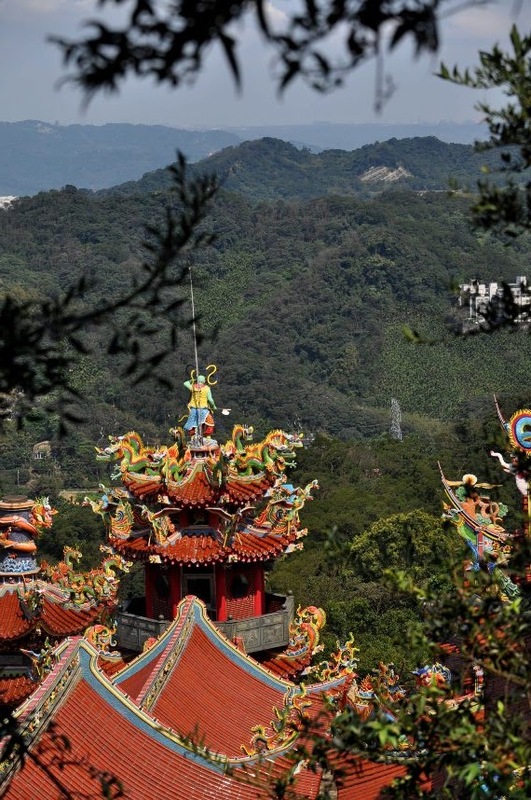 Bien équipé, je file dans les monts de San Hsia pour inspecter les plantations et y saisir l'esprit printanier. Ce gros roc devient ma montagne de thé. J'y dispose mes accessoires pour un Cha Xi du renouveau. 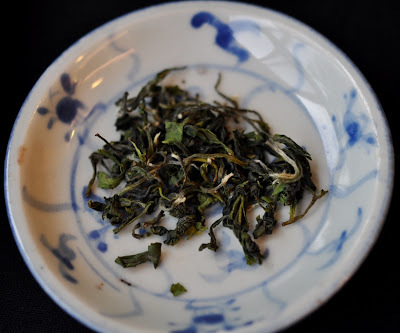 Les feuilles vertes de mon Oolong de très haute montagne, Qi Lai Shan, du printemps 2011 sont à la mesure de ce cadre et de la météo. Ses arômes me transportent à plus de 2000 mètres de haut! Avant de tenir ce blog, et surtout avant mes études du thé, je n'arrivais pas à sentir toutes ces subtilités. Avec le vin, cela ne me posait pas de problème ; quelques cours d'oenologie avaient aiguisé ma curiosité avant de venir à Taiwan. Mais le thé est un monde bien plus opaque. Il y a quelques semaines, en buvant un reste ancien, je me rendis compte que ce thé, acheté il y a plus de 10 ans (avant mes études), ne venait pas d'une montagne Taiwanaise, mais d'Asie du Sud Est! Le goût avait une amertume prononcée et sombre, et le profil des arômes est très différent. 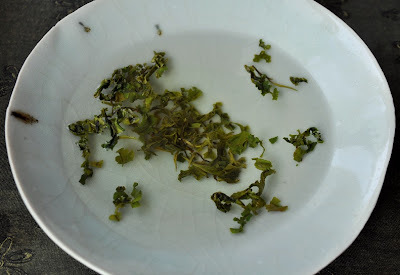 Mon blog m'a permis d'apprendre comment bien préparer le Oolong et de sélectionner des feuilles qui sont ce qu'elles annoncent. La base de toute qualité est la bonne connaissance du produit, savoir quel thé on a en face de soi. Pour cela, connaitre les standards est la fondation de toute apprentissage. 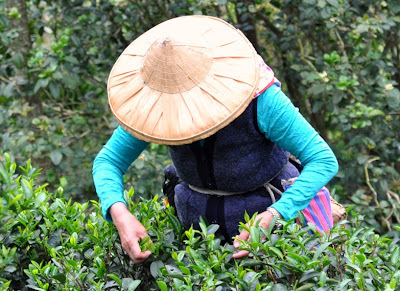 Si la provenance du thé n'est pas claire (cultivar, lieu d'origine, saison, année...) alors on ne peut pas apprécier un thé à sa juste valeur. Quelle caractéristique a un Oolong de haute montagne, un thé vert du début du printemps, un puerh sauvage, un Hung Shui Oolong âgé...? Si on n'a pas d'étalon or, de thé standard, on n'arrive pas à saisir cette caractéristique avec précision. Avant de différencier les thés entre bons et mauvais, il est donc nécessaire de savoir les différencier entre exacts ou non. C'est-à-dire, le thé est-il bien ce qu'il prétend être? Le gaiwan en porcelaine est l'accessoire de la vérité. Son rendu neutre fait parler le thé si on a bien appris à goûter son langage. Ensuite, comme au saut en hauteur, on s'attaque à la qualité en plaçant la barre de plus en plus haut. Le progrès se nourrit aussi de ce que nous nous habituons rapidement à des saveurs plus élégantes. Cette exigence de qualité de plus en plus accrue est humaine et naturelle. Chacun poursuit cette route à son rythme, selon ses envies, ses moyens, son temps, bien entendu. Une nouvelle saison de récolte va bientôt commencer. J'espère recevoir vos commentaires et impressions sous les articles en question afin de partager avec tous vos découvertes, vos coups de coeur. Merci d'avance. J'admire la pureté et le contraste de la fine porcelaine blanche du gaiwan sur ce roc. Mais on pourrait aussi y voir la trop parfaite modernité coupée de la nature. Le bol à émaille noire de Jianyang trouve bien plus naturellement sa place ici. Sa forme est si simple. Les variations noires et brunes ont une certaine régularité, mais pas de symétrie. Elles sont le fruit du hasard des réactions de l'émaille lors de la cuisson. Il n'y a pas deux bols semblables. Le génie de la dynastie Sung (960-1279), qui a créée ce style de bol, est d'avoir cherché un raffinement en harmonie avec la nature. Et tel était bien ce que je ressentais durant ce Cha Xi du renouveau! La fraicheur d'un thé vert de 6 ans!